Why a separate sport blog? The Nigerian flag will for the first time parade in an opening ceremony of a Winter Olympics in Pyeongchang on 9th February. Indeed they will have an all female team taking part in 2 events the women's bob and skeleton. Sean Adigun, Ngozi Onwumere, and Akuoma Omeoga are the women of the Nigerian bobsleigh team. They reached the qualification standard in November but how to consistently remain the in the world top 60 until mid January to ensure their qualification. The three are all former Athletes and indeed this will not be driver Sean Adigun's first Olympic experience, she took part in the 100m hurdles in the 2012 London Olympics but finished 4th in her heat and did not advance. It was Seun who is studying for a Doctorate in Chiropractics in Texas who first experienced the sport getting involved as a brakewoman on the American programme. She realised that the sport could really develop into new areas and reached out to Onwumere who she used to coach who retired from athletics ahead of Rio 2016 and Omeoga. Thirty years on from Jamaica's dramatic debut in Calgary, Africa can now say they have a bobsled team. The rest of the Nigerian team is also a slider Simidele Adeagbo was born in Canada 36 years ago and was a NCAA champion Triple Jumper during her time at the University of Kentucky. She too had hopes of the Olympics gave up on her dream in 2008. However, when she heard of Seun's ambitions to get a bobsleigh to Pyeongchang she too became inspired by Seun and her team's dream. She went for try out for the Nigerian Bobsled and Skeleton Federation in Houston, Texas where her triple jump experience helped her get up to speed to hop unto a sled after 30 metres. These are the first female competitors from Africa to take part in the sliding events and along with Ghana's Akwasi Frimpong, who moved to the Netherlands when he was eight, taking part in the mens's skeleton they are the first African sliders since South Africa's Tyler Botha made Africa's only sliding appearance at Turin in 2006 in the Men's skeleton. I expect many people have never heard of George Lyon and Margaret Abbott two defending Olympics Champions the reason for this is that they won their St Louis in 1904 and Paris in 1900 respectively. Their sport is returning the Olympic schedule in Rio so the longest reign as a defending women's champion will come to an end for Miss Abbott. Margaret Ives Abbott took part in the excruciatingly long and drawn out second Olympics. 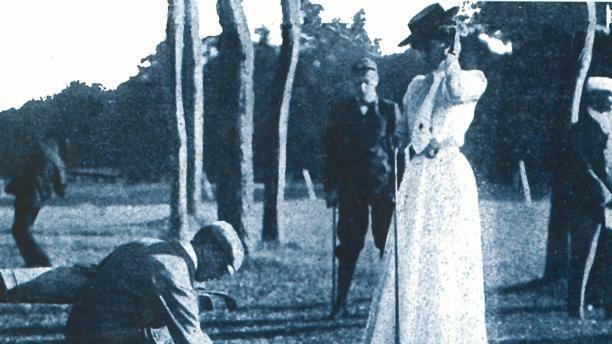 She was one of ten women who took part in a golf event at Compiègne over 9 holes. Her mother Mary was another of those in the field and they will still hold the record of being the only mother and daughter to have competed in the same event at the same Olympics: Mrs Abbott shot a 65 to come in 7th. Miss Abbott a 23 year-old student of art from Chicago shot 47 to win a prcelain bowl as no medals were presented in Paris. She had been over in Europe to study art under Edgar Degas in Paris and persuaded her mother to extend their stay so that they could enter this tournament. Her win may have been helped as she recalled by many of the players "misunderstanding the nature of the game...and turned up to play in high heels and short skirts." However, Margaret Abbott until her dying day in 1955 never knew that she was an Olympic champion such was the confusion around the Paris Games that what sports had been part of the Games, many were not recognised by the IOC until long after the competitors had left and the publicity wasn't what it would be today. Unlike Margaret George Seymour Lyon was aware that he was an Olympic Champion after his participation in St Louis in 1904. His early sporting prowess however was in Cricket in which he represented Canada 8 times at was at one time the holder of the highest score ever hit in Canada, 238 not out. 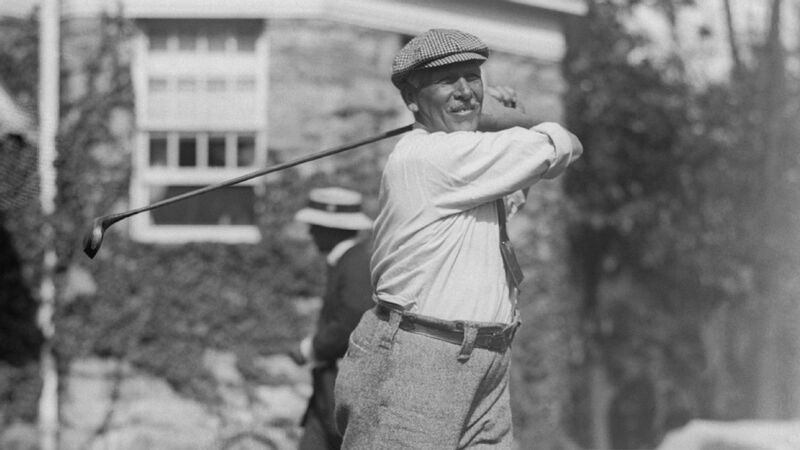 He only took up golf aged 38 in 1896 but within 2 years he had won the first of his record 8 Canadian Amateur titles. Thus is was at the age of 46 that he made his way south to St Louis where 75 golfers played first a 36 hole qualifier. He was one of only three who were not from the USA the other two being the fellow Canadian father and son pair of Albert and Bertie Austin. Lyon shot 169 six off the low score to be tied 9th in the qualification. The top 32 then progressed to a match play format over 32 holes a round. In the first round Lyon beat John Cady, a great-grandson of Linus Yale the lock maker, 5&4. He then destroyed Stuart Stickney 11&9. In the quarter finals he faced Albert Lambert, the son of Jordan W. Lambert whose pharmaceutical company produced Listerine, he beat him 5&4. Lambert had been 8th at the Paris games. In the semi-finals he beat Francis Newton 1 up, but along with his bronze in the individual alon with Cady, Stickney and Lambert amongst their number Newton won team bronze with the Trans Mississippi Association. In the final Lyon was to face the US Amateur Champion of 1904, Chandler Egan. At 23 Chandler was exactly half the age of the Canadian. But and had actually been playing the sport for as long as his elder opponent. But in the end it was a 1up win that secured the medal for Lyon. He would travel to England for 1908 taking part in the Open but the Olympic tournament he came over hoping to defend didn't take place. He had been runner in the US Amateur title in 1906 after a second win for Egan in 1905. However, next month the 116 and 112 years reigns of Margeret Abbott and George Lyon as Olympic Golf Champions will come to an end, sadly Rory McIlroy will not only not be there but probably not watching either. With their first win in 79 years at the weekend Great Britain won their 10th Davis Cup in the 115 year history of the tournament but who were the other nine teams who lifted the cup. When the tournament started in 1900 it was a match between the USA and Great Britain. It also initially wasn't annual with the USA winning in both 1900 and 1902. But from 1903-1906 Great Britain recorded their first four wins on the bounce. Those first winners in 1903 had a lot in common with the team of 2015. It was comprised of the brother Reginald and Laurence Doherty. Both were Wimbledon Singles Champions and claimed the cup in Boston, Massachusetts. . But Reginald gifted the Americans the first game as a walk over. But the two managed to win all four of the remaining matches to bring the cup to Britain for the first time. The following year the tournament took place outside the USA for the first time on the turf at Wimbledon. It also saw more countries taking part with France and Belgium playing off for the right to challenge the champions. Just like in 2015 it was Belgium that would face the British in the final. Reginald no longer took part in the singles his place taken by Frank Riseley who had been beaten by Laurence Doherty in the previous two Wimbledon finals. He secured the first rubber for the lose of just 4 game, Laurence took the second for the lose of just 6. It was then the Doherty brothers who sealed the defence with a 6-0, 6-1, 6-2 win in the doubles. 1905 saw the tournament return to the All England Club in Wimbledon. With the addition of teams from Australasia and Austria plus the return of the USA to the tournament. The other five nations played a challenger series for the to take on Great Britain in the final and it was the USA who for the first time earned the right to play the British for the title. Frank Riseley was not present this time his place was by his partner in the doubles that would take on the Doherty brothers in every Wimbledon doubles final from 1902-1096, Sidney Smith. 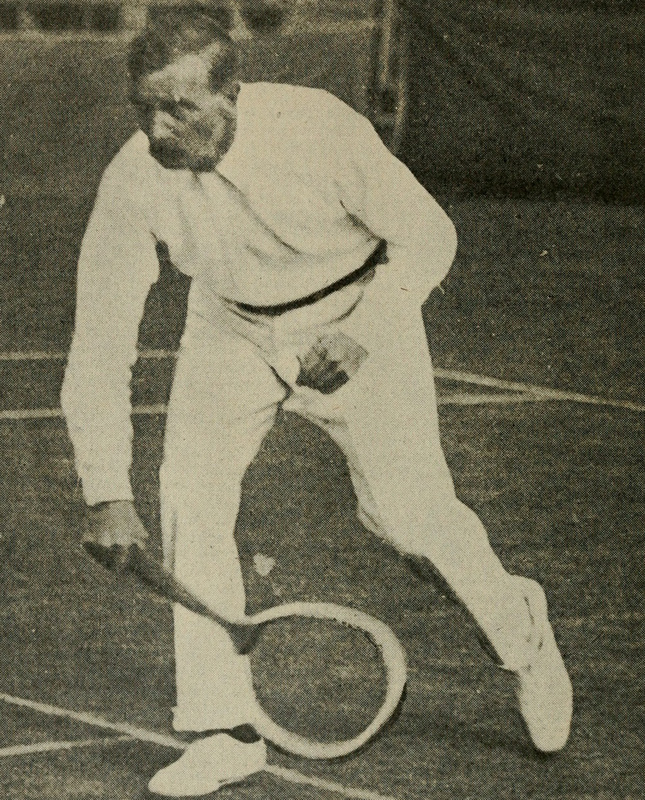 Smith himself had lost to Reginald Doherty in the 1900 Wimbledon singles. This time it wasn't so much of a walkover the first match saw the reigning Wimbledon Champion (1905) Laurence Doherty take on the reigning US Champion (1904) Holcombe Ward. Ward took a two set lead 9-7, 6-4 before losing the final three 6-2, 6-1, 6-0. Smith then stepped up for his debut and took the better end of four tough sets against William Larned 6-4, 6-4, 5-7, 6-4. It was the Doherty brothers next who took five sets to overcome Ward and Beals Wright 8-10, 6-2, 6-2, 4-6, 8-6. With the remaining two rubbers being dead it didn't stop Larned taking Laurence Doherty to his third five set rubber of the match before losing to the Brit. Larned didn't play the final rubber and Smith took an easy win over Goerge Clothier. The following year saw an unchanged Great Britain team take on a USA team of Ward and Raymond Little who had made the trip to also take on the best at Wimbledon. The two American's lot all five of the rubbers taking only the first set in the doubles off the Doherty brothers and Little taking the first and third off Laurence in the final rubber before succumbing in five sets. It was to the be the last of that era of played although when Great Britain next won some of the players then had been the young stars trying to make an impact against the Doherty brothers, Riseley and Smith. One of them was Arthur Gore who only played in the challenger round in Folkestone and didn't make the trip to Australia for the final. Another was Herbert Roper-Barrett who had partnered Gore to the gold in the doubles at the 1908 Olympics and well as the following year's Wimbledon title, but by 1912 was the partner of the only British player to play in both the challenger and final series Charles Dixon. Dixon made the trip to Australia he was to win the men's doubles at the Australian Open as part of that trip in what was an all British final. He also reached the quarter finals of the men's championship. His partner in that final was James Parke, who had won the men's singles as well, he teamed up for one of the beaten pair in that doubles final, Alfred Beamish, as well as playing the other single's matches in the final against the Australians. Beamish had actually knocked Dixon out of the Australian championship. Parke took the first match in the final beating the 1911 Australian men's champion Norman Brookes in four sets. Dixon then took the second rubber with a win over the 1905 and 1910 Australian men's champion Rodney Heath also in four sets. Parke and Beamish lost out in the doubles and Dixon experienced his only lose in 5 matches in the 1912 International Challenge to Brookes in the reverse singles. It all came down to the final rubber and a battle between the new Australian champion Parke of the British Isles and the previous year's champion Heath of Australia. In the end it was the easiest of the three British wins with the Irishman taking that final rubber 6-2 6-4 6-4. After a five year gap the Davis Cup was returning to Great Britian, little did the players then realise it would be another 21 years before Britain won it again. The second phase of British dominance in the Davis Cup came in the 1930s. As has been mentioned many times during the recent run of the GB team it was a team with one of the best played in the world as its talisman. Fred Perry was that talismanic figure in the British team of the 30. He played in 20 matches and his record was 34 wins from the 38 matches singles and 11 out of 14 doubles that he played in those matches. Andy Murray's current record is 27 wins from 29 singles and 7 out of 12 doubles matches is comparible. But unlike Murray who was so far head and shoulders above any other singles player for his nation at the time throughout this period of British dominance Perry had an able spur in Bunny Austin who himself had been world number 2 in 1931 and reached at least the quarter finals in all four of the grand slam tournaments. Between them Perry and Austin were two of the strongest singles players in the world at the time and were more than a match for any of the teams then met along the way. In 1933 they had to come through the Europe zone with wins over Spain, Finland, Italy, Czechoslovakia and Australia between 21 April and 15 July for the right to face the USA in the Inter-Zonal. The Interzonal match was at Roland Garron on clay and came one week after the Europe zone final on the grass at Wimbledon and a week before the final also in Paris. The Australian's had Jack Crawford who in 1933 won three of the four legs of the Grand Slam, only missing out in the final of the US championship. He beat both Perry and Austin in the Zone final, but the Brits won both their reverse singles against Vivian McGrath. Perry had paired up Patrick Hughes with whom he's won the French championship pairs that year to secure the vital other point. For the Inter-Zonal the USA has the 1932 Wimbledon and US Singles champion Ellsworth Vines and Wilmer Allison in the singles. The Brits started with Austin beating Vines and Perry beating Allison both in straight sets. The doubles team were the 1931 French and Wimbledon doubles champion pair of George Lott and John Van Ryn, the latter teaming up with Allison to take the US title as well that year. This pair took a straight set win over Perry and Hughes. Austin took on Allison in the first of the reverse singles and won it four sets. Perry v Vines was the battle of champions and though it may have been a dead rubber was hard fought. The score was 1-6 6-0 4-6 7-5 7-6 to Perry when Vines had to retired injured. The final against France feature three of the famous Four Musketeers, the only one missing being the other player from the two nations with a later name in sportswear René Lacoste. Jean Borotra and Jacques Brugnon teamed up for the pairs and Henri Cochet took part in the singles along with André Merlin. Merlin lost the first rubber to Austin in straight sets before a five set classic between Cochet and Perry which saw the Englishman triumph 8-10 6-4 8-6 3-6 6-1. Patick Hughes had been joined by Harry Lee in the doubles but the French duo won in straight sets. Cochet won the first of the reverse singles but only by taking the fourth and fifth sets 6-4. It teed up Perry the chance to regain the cup after 21 years and though he lost the first set 6-4 he won the next three 8-6 6-2 7-5. The following year GB only had to take part in the Challenge round at Wimbledon, the same four players would take to the court. Again the British won both singles on the first day but lost the double. 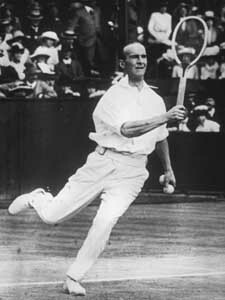 Perry was first up against Frank Sheilds who in 1931 at Wimbledon became the only Grand Slam finalist in history to default without hitting a ball due to injury. That match would have been against his Davis Cup team mate Sidney Wood. The fourth set went to 28 games but was enough to earn Perry a three sets to one win and Bunny Austin also won the dead rubber. In 1935 there was one change in the GB team with Raymond Tuckey partnering Hughes in the pairs. The opponents were the same nation but Don Budge had taken Shields place in the singles and Wilmer Allison was now partnering John Van Ryn in the pairs. But the British whitewashed the Americans on the grass of Wimbledon. Which brings us to 1936 and the last of those previous triumphs, it was to be an unchanged side from the year before up against the Australians Jack Crawford and Adrian Quist. Once more on day one the Brits took both rubbers, and once again lost the doubles. On the final day Austin faced Quist first but lost in four sets so it was Crowford v Perry just as in the zone final that led to the start of the run. This time however it was Perry who had earlier in the month won his third Wimbledon title on the same court who came away victorious in a straight set win to give GB a 3-2 win. Yesterday I rather mistakenly said that it was the first time that Ireland took part in the Olympic Hockey tournament. I was wrong. In fact in 1908 along with France and Germany there were representatives of the four nations of Great Britain and Ireland taking part. GK Edward Peter Cowan Holmes b 25 Apr 1880 in Carrickfergus, County Antrim. He played for the Cliftonville team in Belfast. Henry Joseph Brown b 1887 in Dundalk, Louth who played for Dublin University. Walter Ernest Peterson b 7 Nov 1883 in Blackrock, Dublin who played for the Monkstown club in Dublin. William Ernest Graham b 29 Jan 1886 in Dublin, who was another member of the Monkstown club. Walter Islay Hamilton Verschoyle-Campbell b 14 Oct 1884 in Dublin who was another from the Dublin University team. He went on to become a Civil Engineer in Woolwich. Harold "Henry" Lawson Murphy b 12 Dec 1882 in Notting Hill, London. Was a player for Three Rocks Rovers in Dublin. Charles Frederick Power b 26 Aug 1887 in Coonoor, Tamil Nadu, India was another from the Three Rocks Rovers team. In the official Olympic report he is mistakenly listed as E.F. Power. Richard George Stanhope Gregg b 9 Dec 1883 Portsmouth, Hampshire, England the third member of the Three Rocks Rovers team. Edward Percival Allman-Smith b 3 Nov 1886 in Balbriggan, Dublin he was studying medicine and playing for the Dublin University team at the time of the Olympics. He went on to a career as a soldier, serving in the Royal Army Medical Corps from 1912 though WWI and eventually retiring in 1949 with the rank of Brigadier after serving as Deputy Director of Medical Services from 1941-42 in Palestine and Trans-Jordan. Frank Lubbock Robinson b 1886 in Rathdrum, Wicklow he was playing for the Malone club in Belfast, he died on the island of Jersey in old age. Robert Lindsey Kennedy b 31 Jul 1880 in Edenderry, Lisburn. He played for Banbridge but later emigrated to Canada. Also listed as on the squad was Jack Peterson b 22 Jan 1880 in Dublin the elder brother of Walter who was also on the team.
. The Official Olympic Report describes the match as follows. In this match the Welsh halves and backs were seen to great advantage defence, especially during the early stages, Richards, Evans, Shephard, and Lyne being responsible for brilliant work. Turnbull also gave an excellent account of himself in goal, and despite clever combination on the part of the Irish forwards Wales held the lead until near the interval. When four minutes had elapsed the Welsh halves placed the forwards in possession, and good passing enabled Williams to reach the circle. Brown checked him, but before the ball was cleared Williams shot through. The Irish forwards then put their opponents to a severe test, and time after time Richards, Evans, and Shephard relieved their side. On one occasion Turnbull just managed to kick away from Gregg, who was close in, and a few minutes later a rush by the Welsh forwards was nullified by smart work by Holmes. Ireland continued to force matters, and a fine dribble, in which Gregg, Power, and Allman-Smith took part, ended in Turnbull saving at the expense of a corner, which proved futile. Then a penalty in front of the Welsh goal was cleared by Shephard, but Ireland quickly returned, and Robinson equalised from a pass on the right. This was quickly followed by another goal, a shot by Power glancing off Turnbull’s legs, so that at half-time Ireland led by two goals to one. On changing ends the Welsh forwards played well together, only to be intercepted by Peterson, Brown, and Campbell; and Holmes now and At the other end Robinson twice had an openagain saved fast shots. goal, and he missed the net by a few inches. Most of the play took place in the Welsh quarters, and, after Turnbull had kicked away from Robinson, Gregg credited Ireland with a third goal. From this point the game was of a more even character, the Welsh forwards passing in brilliant style, but there was no further scoring, and Ireland won by three goals to one. At a quarter to two of a brilliant afternoon, on October 31, some six thousand spectators gathered in the Stadium to watch the final of the Hockey competition between England and Ireland. The ground had been well rolled, but had naturally suffered both from the constant use of the last few days and from the firework displays in the evenings, but in spite of this surprisingly few mistakes were made. Ireland began in dashing fashion, and frequently looked dangerous, despite some splendid saving work by Noble. Five minutes passed by before England troubled their opposition for the first time, and then Logan shot wide from a good position. From the twenty-five yards’ bully Shoveller worked out to the right before hitting up a centre, which Logan just pushed out of the reach of Holmes, and registered England’s first goal. An Irish attack was broken up by Page, and at the other end a promising position for England was spoiled through Shoveller being penalised for turning in the ball—well inside the circle, too. Thirteen minutes from the commencement Robinson checked the Irish left wing beautifully, and going on, the Oxonian passed to Rees, who centred accurately for Logan to beat Holmes with a superb oblique shot. Nine minutes later Logan passed inside to Shoveller, who cleverly touched the ball for Pridmore to go through and find Ireland’s net at close quarters, England leading at half-time by three goals to love. England received a startling surprise in the first minute after changing ends. Freeman stopped a hit by Gregg with his shins, from whence the ball rebounded into touch. The umpire gave a free hit, and Graham directed this so accurately that Robinson was enabled to score with a shot that gave Wood no chance whatever. Three minutes followed, and then Pridmore gave Shoveller a lovely pass. The Hampstead centre went through and shot at Holmes. Holmes saved, but failed to get the ball far enough away, and Logan nipped in smartly to increase England’s advantage. Next came a wonderful goal by Pridmore at an apparently impossible angle, but by this time England had taken command of the game and won with eight goals to one. Ireland as a result won the silver medal. It was to be the first medal in Olympic history that could be credited to Ireland though others had been won by Irish competitors before then. Though officially in the records this silver medal is listed as being on the four that GB won in the Hockey in 1908 Olympics, with Wales and Scotland both picking up bronzes for being beaten in the semi finals. Yesterday GB's women gymnasts finished third in the team competition in the World Championships in Glasgow behind only the US and Russia. It is a performance that secures the team that narrowly missed out on team medals finishing 5th in London 2012. The men led the way after completing their competition on Sunday but with other nations taking part on Monday their qualification will not be officially made until every nation has completed. Yesterday also say action at the Lee Valley White Water Centre. In the Olympic Trials David Florence took two wins in the C-1M and then pairing up with Richard Hounslow in the C-2M. It means that the pair who had the last run in the final in 2012 but were unable to unseat team mates Etienne Scott and Tim Baillie have provisionally booked the only spot in the event for Rio. The selectors will confirm the selection on 4 November. Meanwhile a win for Australia today was enough to see Ireland's men's hockey team jumping for joy. The win for Australia over New Zealand in the Oceania cup final today means that the highest ranked team from the Hockey World League semi-finals in July yet to qualify for Rio secure a slot. The 11th place that Ireland's men secured in that event mean that for the first time Ireland will be represented in Olympic hockey. Elsewhere, in Frankfurt, Scottish distance runner Callum Hawkins making his debut appearance in a Marathon finished 12th in a time of 2 hours, 12 minutes and 17 seconds. It means that he is only the second British man, along with Scott Overall, to have run under the Olympic qualifying time of 2 hours 14 minutes this year. Callum's elder brother Derek wore the blue of Scotland in last year's Commonwealth Games Marathon, while the younger sibling took part in the 10,000m. Derek, who is currently out with a foot injury will be inspired to have a chance of competing alongside his brother in Rio when he returns. Jules Bianchi was not even five years old the last time Formula 1 witnessed a death of a driver in the top division of Motorsport. It speaks volumes that the 20 years between that fateful weekend at Imola until the crash at Suzuka some nine months ago is the longest in the history of the sport between fatal accidents. His career was more like that of Roland Ratzenberger the "other driver" whose live was lost at that May Day weekend in Imola seeing as he was at the start of his Formula 1 career rather than a success like Ayrton Senna. 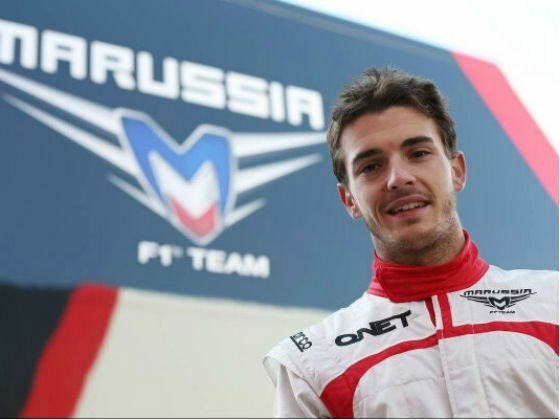 He has made his debut for Marussia in the Australian Grand Prix at the start of the 2013 season. His only point for his team had come in Monaco in May 2014 where he came ninth. However, his career in lower Formula had seen him win the 2009 Formula 3 Euro Series ahead of Valterri Bottas who was third and now races for Williams-Mercedes in F1 and Esteban Gutiérez (now Sauber) in ninth. The previous year he had been third in the same Formula when it was Nico Hülkenberg (now Force India-Mercedes). In 2010 and 2011 he moved unto Moto GP seen as the final testing ground in racing before earning a seat in F1. In 2010 he was third in the championship behind fellow graduates to F1 Pastor Maldonado (now with Lotus-Mercedes) and Segio Pérez (now Force India-Mercedes). The following season he was again third this time the winner was Romain Grosjean (now Lotus-Mercedes) who had been 14th the season before. The Japanese Grand Prix last year was Bianchi's 34th start in him embryonic Formula 1 career. His team Marussia were facing financial difficulties at the time he lined up in 20th place on the grid on the 5th October. Typhoon Phanfone was due to make landfall in Japan that afternoon and although the typhoon itself was to miss the circuit. The heavy rainfall from the northern edge did however mean that the race started under safety car only to be red flagged after a mere two laps, with the cars lining up in the pit lane instead of the gird as is normal bringing a fear of cancellation. But 20 minutes later the race was under way again, although once more initially under safety car after the ninth lap the racing was finally underway as the safety car was pulled in. It was an incident on lap 42 that was to prove fateful for Bianchi. It was the Sauber of Adrian Sutil that was had spun and crashed into the run off area on the outside of turn 7 the Dunlop curve. But on the following lap while Sutil's car was being removed from the track Bianchi came off at high speed at the Dunlop curve and collided with the crane involved in removing the damaged Sauber. He was unconscious as a result of the crash not responding to team radio and was rushed to hospital for surgery to reduce severe bruising to the brain. He was kept in an induced coma since the incident but died as result of those injuries last night. Shortly after the crash, it was announced that had Formula 1 allowed three cars a team this season that Bianchi was to have become the third driver for Ferarri. Marussia made their final appearance at a Grand Prix the following weekend at the inaugural Russian Grand Prix but failed to compete for the rest of the season. This season it has arisen as Manor-Marussia though has yet to register a point. Jack Kyle who passed away today was the last surviving Ulster player on the team that lifted Ireland's first Grand Slam in 1948. 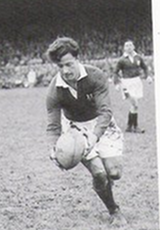 In all the trainee Doctor (pre-1951) and later surgeon made 46 appearances for Ireland from 1946-1958, and appeared 6 times for the British Lions on his only tour with them to Australia and New Zealand in 1950. As a result of that tour he was named one of the six players of the year in the 1950 New Zealand Rugby Almanac which said he was "an excellent team man, faultless in his handling, able to send out lengthy and accurate passes, and adept at making play for his supports." In 2002 he was named the Greatest Ever Irish Rugby player, the captain of that team a fellow doctor Karl Mullen was then named the Greatest Captain. At the time of the 1948 5 Five Nations series he was one of a number of student doctors on the team, he was to graduate from The Queen's University of Belfast in 1951. He at the time without the substitutions we know today he played from his international debut in 1947 for an impressive seven consecutive seasons without injury until he briefly was unable to play in 1954. After scoring one of his seven international tries in 1953 at Ravenhill one of the journalist immortalised the event in verse. They seek him here, they seek him thereThose Frenchies seek him everywhere.That paragon of pace and guile,That demned elusive Jackie Kyle. After he retired from international rugby he embarked on humanitarian work using his medical skills first in Sumatra and Indonesia, then from 1966-2000 as a consultant surgeon in Zambia. Therefore as well as being installed in the IRB Hall of Fame in 2008 he also the year previously received a Lifetime Achievement Award from the Irish Journal of Medical Science and the Royal Academy of Medicine in Ireland. When Ireland won their second Grand Slam on 15 February 2009 Kyle was there to witness the passing of the flame. Seven other men from that original team 61 years earlier where still alive to see the day. Other members of that momentous team included Des O'Brien the 1966 Lions manager, Billy McKay a fellow student doctor at Queens, Barney Mullan, John Daly. The sad news to wake up to this morning is that Australian batsman Phillip Hughes who was hit on the head by a bounced while playing for South Australia against New South Wales has died as a result of the damage he sustained to a major artery as a result. He had been in an induced coma since an operation after he was rushed to a Sydney hospital following the incident. Although he was only 25 he made his test debut on 26 February 2009 against South Africa. 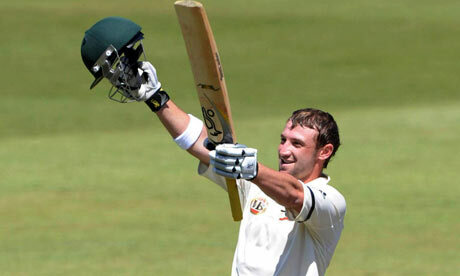 Although in his first innings he was dismissed for a duck, he took a half century in the second innings. But in the second match in that series scored the first of what were to become 3 test centuries in the first innings with 115 to be followed up with he record test score 160 in the second. He was the youngest man in test history to take a century in both innings of a Test Match. It is a shame now in hindsight that his last outing in the baggy green cap of Australia was at headquarters and saw him only scoring a single in both innings. He was born in Macksville in New South Wales, for whom he made his senior debut in 2007 before moving to South Australia in 2013. He has also appeared for Middlesex, Hampshire and Worcestershire in England, Mumbai Indians in the IPL and for Sydney Thunder and Adelaide Strikers in the Australian Twenty20 Big Bash League. He was three days short of his 26th Birthday and had been scheduled to play in next week's test match against India. The current round of Sydney Cup matched have been cancelled and next week's test is now in doubt as it is suspected that very few of his international colleagues may be prepared to return to the field so soon. Continuing my list of Olympic athletes who have died here is the next quarter of 2014. As usual they appear in bold either in the Olympiad they first medal in or if they never lifted a medal the one they first appear in. István Major (see above) tied 24th men's high jump. The following is the list of Athletes who have taken part in the Olympics who have passed away in the first quarter of this year. They are listed under the years in which they competed details are next to their first medal performance (or if they did not medal their first appearance). © Stephen Glenn 2005-2016 The writer retains the intellectual rights to all original content. Picture Window theme. Theme images by Adivin. Powered by Blogger.